The Anne Arundel County Cold Case Homicide Unit is asking for the public’s assistance with an unsolved murder from 1985. On April 23rd, 1985, decomposed remains were found during the excavation on the construction site of the Marley Station Mall in Glen Burnie. The body was found in a metal trash container. It’s been determined the remains were that of a white male in his mid 20’s, approximately 5’8” to 5’11” tall, with a slim build and brown hair. He was wearing a blue and black sweater, slacks and leather shoes. It was estimated the victim was deceased for approximately five months. Detectives estimate the victim would have disappeared during the late fall 1984 until the new year of 1985. Several attempts have been made to identify the decedent; however, all attempts have ended in negative results. In March of 2015, Cold Case detectives sought the services of Parabon-Nano Labs. Parabon, a DNA technology company that specializes in DNA phenotyping, the process of predicting physical appearance and ancestry from unidentified DNA evidence. Law enforcement agencies use the company’s Snapshot DNA Phenotyping Service for lead generation and narrowing suspect lists in criminal investigations. DNA was extracted from the remains of the unidentified decedent for the analysis. The decedent’s skull was also sent to Parabon for a forensic facial reconstruction. 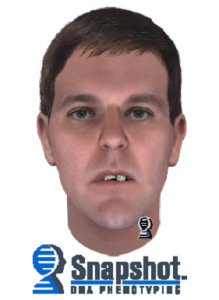 By combining results from DNA phenotyping and facial reconstruction representatives from Parabon, including forensic artist Thom Shaw, have produced a composite.